When political change is not accompanied by widespread economic change, there is a risk of reversion… When old economic structures are preserved or only modestly adapted, it cannot be expected that different outcomes on growth and equality will result. — Oxford University Press. Mostly hidden from western eyes, Tunisia, the only nation to successfully emerge democratically from the Arab Spring, is stacking up political successes. But democratic achievement has not lifted the economic malaise that sparked the Arab Spring and continues to fuel sometimes-violent discontent. Still, the democratic advances are real. 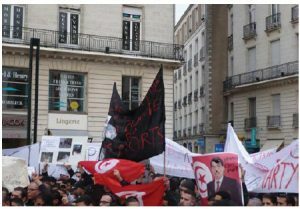 In May, the sports stadium outside Tunis was ear-splittingly loud as the Islamic Ennahda Movement’s 10th conference opened. The audience spilled out of the stadium into the warm evening whereas speakers blared. Supporters cheered for hours as luminaries hit the stage for full- throttled speeches. Singers, dancers and other performers entertained in between. I was lucky to witness this. Because of my writings on the Arab world, Ennahda invited me to attend the conference. I was among a small group of international guests close to the stage. At first, I was unaware of the historic events that were about to unfold. I did notice, however, that none of the women wore veils and a significant minority wasn’t even wearing headscarves, including some female ushers and speakers on stage — this would be unthinkable for Islamic meetings elsewhere in the region. To a rapturous welcome, Ennahda leader and founder, 74-year-old Rached Ghannouchi, took the podium last. He had founded Ennahda three decades earlier to promote Islam and protect it from what he saw as attacks from a secular state. Most of the intervening years he spent in exile. His was the most remarkable speech. As his words floated on waves of cheers, he was telling his movement to step aside from political Islam. When he founded Ennahda, he explained, Islamic values were under threat. They were no longer under threat, so it was time to move on, he told his followers. And so it was. He also promoted a vision of free-market reform. When I arrived in Tunis in May, Ennahda was an Islamic democratic movement; five days later, when I Ieft, it was a democratic political party, after members gave Ghannouchi massive support. Party officials were barred from holding official religious positions. Leaders compared the party with market-friendly European non-sectarian, tolerant Christian Democratic parties, which may take moral guidance from religion, but support separation of state and religion. Many remarkable things happened and were said at the conference, but first let’s look at the causes of the Arab Spring and the economic situation to get a sense of whether Tunisia’s democratic miracle will endure. The western media interpreted the Arab Spring as a “struggle for democracy and fundamental rights.” There was some of that, but it was primarily provoked by low levels of economic freedom, high levels of government regulation and phoney reform saturated by corruption. Tunisia and other Arab states, which suffered significant violence or government change during the Arab Spring, all had lousy economic policy — either crony socialism or crony capitalism, suppressing economic freedom. Both allowed the elite to control the riches of the state and exclude others. All nations with large-scale Arab Spring disruptions were down around 90 out of 150 on the Fraser Institute’s Economic Freedom Index when demonstrations erupted and, as a result, had sluggish and weak economies. The usual “security” compact in dictatorships, whereby citizens give up freedom in exchange for security, was supplemented by a perverse economic deal. The poor got subsidies and benefits from extended patronage networks; the middle class got guaranteed government jobs in exchange for often worthless “university” degrees; and the rich got to loot the country. This created incentives for all segments of society to milk the state rather than engage in productive activity. Skyrocketing Arab birth rates, which sent costs through the roof, disrupted the deal. Arab states could no longer afford the subsidies or government jobs for a bulging youth population. Western donors, a key source of funds for poorer Arab nations, balked at sending more billions down the rabbit hole of destructive economic policy. To keep money flowing, with the support of international institutions such as the IMF and World Bank, Arab nations started to “reform,” de-tangling regulation and privatizing state enterprises. Some of this helped. Economic freedom, growth and investment ticked up in places like Tunisia and Egypt. But it was mostly a fraud. The bureaucracy liked tangled regulations, a source of bribes from those who needed to cut red tape. Privatization was a cover for shifting resources from elite control through the government to elite control through crony transactions. The Mubarak family in Egypt and the Ben Ali family in Tunisia made off like the bandits they were. Public anger was compounded by youth adrift. Official Arab youth unemployment hovers at 30 per cent, but perhaps three-quarters of young people lack full-time jobs. Polling evidence shows that economic issues were at the forefront for Arab Spring demonstrators, who typically came from the middle and lower-middle class. They expected no-longer-available government jobs. All this exploded in 2011 into a conflagration that spread across the Arab World. Protesters were mainly motivated by a lack of opportunity and jobs in dead crony-capitalist and crony-socialist systems. While the deep-seated problems were economic, no economic vision or structural change emerged from the Arab Spring, leaving in place the same frustrations and anger to fester. Holding elections solved little, and often made things worse. Incredible leadership enabled Tunisia to emerge relatively peacefully with an intact democracy, but without deep economic reform and the opportunity it offers, success will be fleeting. This is crucial. Only an elementary school education is needed to look around the world and see that all stable democracies with prosperity and opportunity have free market economies, though the model varies considerably from small-government Switzerland to big-government Nordic states, which, in all other ways, are market-friendly and open. Those limited free markets, such as Tunisia, struggle with low growth and often democratic setbacks. Yet, opposition to reform is entrenched in Tunisia. Crony capitalist and socialist elites battle any diminution of privilege and the opening of markets to competitors from all rungs of society. The labour elite will fight too. The Tunisian General Labour Union (Union Générale Tunisienne du Travail) played an important and constructive role in Tunisia’s peaceful transition, but is now making things worse, intent on maintaining the privileges its members, and particularly leaders, obtained under Ben Ali. More than 150 strikes in 2015 doubled the workdays lost compared to the year before; the union demands wage increases and exceptional promotions that have no relation to productivity, eroding the nation’s competitive position; and it uses its muscle to maintain job market restrictions that protect a privileged union membership and exclude the disadvantaged through inflexible labour laws. Many in the region, consistent with the research, have told me this undermines work ethics. A World Bank report notes that “the link between a public employee’s performance and evaluation, compensation and promotion is weak, particularly since the revolution.” It damages the higher-education sector, stuffed with institutions to provide middle-class youths pieces of paper that qualify them for the civil service rather than practical education or training. Then there are those who ideologically oppose reform. At an Ennahda seminar, one German NGO representative argued that Tunisia had no need for free markets. I responded that it was interesting that a German, who could see all the prosperity and opportunity that free markets had created at home, would come to Tunisia and say, “Well, this isn’t for you.” This was warmly received by the Tunisians in the room, so minds are still open. Despite the challenges, not long ago, Tunisia’s outlook for a peaceful transition from the Arab Spring looked grim. But people from across society, including elites and religious leaders, put the nation and peace ahead of narrow interests and somehow managed the appropriate compromises. Now, all sectors of Tunisian society must do the same on economic policy. And here again, rays of hope emerge. Ennahda is likely the only significant Arab party that has come out fully in favour of open markets, and not just when talking to international institutions. This neatly captures the problems plaguing Tunisia’s economy and plots the path forward. Tunisia was a society intent on milking the state rather than on productive activity that creates sustainable prosperity. It now must produce its own prosperity and, as Ghannouchi argued, that can only be done through free markets and the private sector, with opportunity open to all, not just the privileged and connected. Ghannouchi hit other areas in want of reform, including social reform. He spoke of cutting government jobs, of the need for greater work discipline, more vocational education, and reform of universities to produce useful training and education rather than degrees for civil service employment. At least in Ghannouchi, international institutions have a leader who is interested in tearing down pillars of privilege rather than enriching cronies. Tunisia faces horrid headwinds, but it faced them in the Arab Spring and sailed through relatively unscathed. If it succeeds in meeting its economic challenge, it will be a beacon of much-needed hope throughout the Arab world. 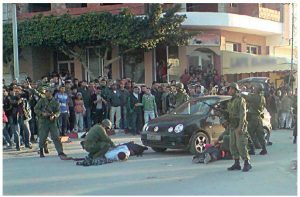 The Arab Spring began in Tunisia as an act of economic defiance: 26-year-old street vendor Mohamed Bouazizi set himself ablaze on Dec. 17, 2010 in Sidi Bouzid, Tunisia, to protest the confiscation of his wares by a city official. Demonstrations and riots spread through Tunisia and then the Arab world. A month later, Tunisian president Zine El Abidine Ben Ali resigned. The Islamic Ennahda Movement won the resulting elections in October 2011, as did the Muslim Brotherhood in a similar situation in Egypt. As in Egypt, protests and violence soon broke out against the regime and here the courses of the two nations diverged. To maintain peace, Ennahda resigned power in favour of a technocratic government that enacted a liberal constitution, promoting equal treatment for women and religious tolerance. Secularists were not completely mollified. Beji Caid Essebsi founded Nidaa Tounes in 2012 from a rag-tag mix of various interest groups, the old elite, business organizations, unions and Marxists, with virtually no policy other than opposition to Ennahda and Rached Ghannouchi. Nidaa narrowly beat Ennahda in the 2014 elections and Essebsi won the presidency. Ghannouchi had declined to run. Yet, during the transition, Ghannouchi reached out to Essebsi to ensure stability and civil peace. The old foes have become partners working for Tunisia’s future. Ghannouchi invited Essebsi to give a keynote address at the Ennahda conference. Essebsi was personally greeted by Ghannouchi and given several standing ovations. If only British or Australian or most European politics could be that civil. For the United States currently, it would be fantasy fiction. Freedom at the Fraser Institute. Fred McMahon is the Michael Walker chair of economic freedom research at the Fraser Institute. He thanks Fraser Institute senior fellow Alan Dowd for his important comments in reviewing this article.